The Classic AV Combat Gi is now available in a new limited edition color-way! This ultra lightweight pearl weave gi is the most comfortable gi we've ever released. Unlike other gis that are heavy and bulky, this gi is so comfortable, that you'll forget you're wearing it! The Combat Gi comes in a custom gi bag and has embroidered arctic blue Alavanca logos on both shoulders and on the left ankle, as well as contrast stitching throughout. The back is intentionally left blank so you can add your academy patch. The single-panel back construction allows for greater durability, faster drying and enhanced comfort when working from the guard. Also available for men and kids. AV Winter Combat Gi (Women) has been added successfully to your wishlist. Note: This gi does not come with a belt. *Sizes indicated are based on the gi AFTER it has been shrunk in the wash. This gi fits slim, so if you're on the border between two sizes, choose the larger size gi for a looser fit, or the smaller size for a slimmer fit. For reference, Eve is is 5'7" (140 lbs) and wears an F3. 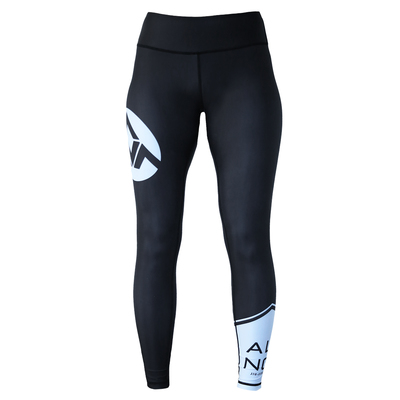 Alavanca Spats (Women) View Sale! 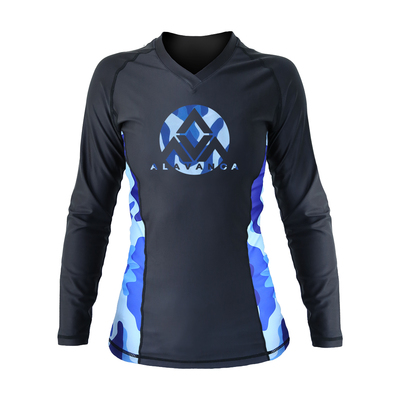 AV Winter Camo Long-Sleeve Rashguard (Women) View Sale!